The Greek orator Cicero wrote, "Law stands mute in the midst of arms." British Director J. Lee Thompson's 1962 Cape Fear pushes that idea one step further: Law stands mute when confronted with its own overbearing shadow, and when that shadow is outlined with vengeance, all systems of jurisprudence are rendered impotent. The only force that can undermine the law is knowledge of the law itself, and when the latter neutralizes the former, the result, ironically, is chaos and violence. In Cape Fear, Thompson, a former boxer and tailgunner in World War II, adroitly examines how the legal system's limitations and the inefficiency of the bureaucracy laws must slog through to prove effective are too often the catalyst for the uncivil behavior they are designed to prevent. Thompson and iconic figures Gregory Peck and Robert Mitchum weave an intricate tale that reveals the haunting fallibility of America's legal system and the disturbing ramifications that unfold when individuals, fueled by their knowledge of the law, ultimately pursue justice through vigilantism. Thompson was a hot directorial commodity in the early 60s mainly because his The Guns of Navarone was nominated for a Best Picture Oscar. As one of the decade's best war films, Thompson's work on Navarone also solidified his relationship with Peck, who starred in the war drama and later purchased the rights to John D. MacDonald's novel "The Executioners." That novel eventually became Cape Fear, and following the trend of male motion picture stars such as Kirk Douglas and Burt Lancaster developing their own production studios, Peck followed suit and eventually helped produce Cape Fear. Previously, Thompson worked as an editing assistant and dialogue coach for Alfred Hitchcock, and his experience with "The Master of Suspense" paid off in this disturbing thriller. Cape Fear indirectly pays homage to Hitchcock's Psycho, but it also detracts from Hitchcock's masterpiece significantly. The most notable similarity is Bernard Hermann's scores, which in both films punctuate the suspense with nails-on-chalk riffs. Another is Martin Balsam, who plays Detective Milton Arbogast in Psycho and Police Chief Mark Dutton in Cape Fear. Mitchum is Max Cady, a recently released prisoner convicted eight years earlier on assault charges in Baltimore, Maryland in a trial that saw Peck, who plays a decent, honorable lawyer named Sam Bowden, testify against him. After studying the law and "human nature" in prison, Cady is released and immediately tracks down Bowden to seek retribution by terrorizing the entire Bowden family. The film devolves into a nasty cat-and-mouse game where both men fall prey to their most primal of instincts. Their endgame explodes in some frighteningly climactic scenes along the Cape Fear River. Mitchum brilliantly depicts Cady's perverse, paradoxical nature. He is a predator that stalks his victims with stealth. He methodically spies on the Bowden family but is not paralyzed by voyeurism. He is a man of action who commits heinous acts upon the Bowden's dog, a female companion, and ultimately, the Bowdens themselves. Bubbling under Cady's diabolical calculations is a ravenous sexual appetite that seems ready to explode. He sexually harasses women and routinely undresses them with his eyes. His libido seems uncontrollable and fuels his animalistic behavior, which is animated by his cool walk, monosyllabic answers, and slouching, slithering figure. However, as we learn more about him, Cady also seems profoundly composed. He has thoroughly learned the law and uses it advantageously to seek revenge. Most astutely, he hires a cagey lawyer to represent him after Bowden aggressively investigates and harasses him. His hunt for the Bowdens is defined by strategy, and he clearly follows his plan. These are not the characteristics of a madman. Although Telly Savalas (who does appear as a gumshoe working for Bowden) and Rod Steiger were originally considered for Cady's role, Mitchum was finally persuaded when Peck and Thompson purchased a case of bourbon for him. Apparently, alcohol was a staple on the set. Their bargaining paid off because the edgy Mitchum is perfectly cast. In fact, there is something appealing about his lack of pretension and irreverence toward society. He is the ultimate outsider who uses an "insider's" rules to fuel his insatiable ego. Riding the coattails of his legendary performance in 1955's The Night of the Hunter, where he plays another demented soul, Mitchum brought his own legal problems to the role of Max Cady. During shooting, Mitchum was on probation for marijuana possession. Furthermore, Mitchum was once arrested in Savannah, Georgia for vagrancy, interestingly, since sections of the film were shot there. He served on a chain gang near the city. His knowledge of prison life and acumen for the despair convicts feel is potent. Peck is equally effective in serving as Mitchum's converse. He is respected throughout his community as a fine lawyer, is happily married, and lives in a domestic paradise. He also revels in all the luxuries an upper middle-class American life offers including vacations, property, and most notably, connections within the legal system. 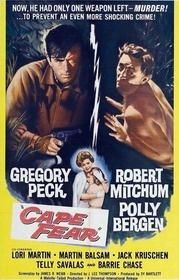 Nevertheless, Peck is cast somewhat out of character since he becomes as ruthless as Mitchum. Peck, who usually played the stoic, handsome man of righteousness, uses that stereotype to offset the uncharacteristic animal he becomes as the film progresses. This is an excellent blend of casting and writing. Fundamentally, Bowden has everything Cady lost while in prison including a wife and children. In fact, Cady and Bowden are perfect parallel characters, and their symmetry guides the narrative: Bowden is a lawyer who becomes a criminal; Cady is a criminal who becomes, metaphorically, a lawyer. Bowden lives in a beautiful Southern estate; Cady walks the streets and resides in cheap hotel rooms. Bowden seeks the help of many cronies; Cady commits his despicable acts alone. Bowden enjoys healthy relationships with his wife and daughter; Cady's relationships with women are fragmented and dysfunctional. The list goes on. However, as their parallels emerge throughout the first three-quarters of the film, each character coalesces in the film's climax as the setting moves from the civilized confines of the city into the primal zones of the wilderness along the banks of the Cape Fear River. Here, essentially, Cady triumphs because Bowden is forced, if he hopes to stop this monster, to play Cady's game. While the Bowden family is protected in a houseboat from Cady, Bowden and his hired gun hover along the shoreline, like animals themselves, waiting for Cady to strike. The setting's dramatic shift works well metaphorically to illustrate how far Bowden has sunk (at one point, Cady holds him underwater to drown him - Peck later said he was underwater for too long in that scene and did almost drown). Not coincidentally, the setting also moves from day to night, and Thompson wisely uses a number of noir lighting techniques to highlight the impending menace. The undulating waves cast in splashes of light are particularly effective. Here, the film's most potent themes erupt: the criminal uses the law for the right reasons, which include a primordial urge to regain the opportunity to lead a prosperous, normal, middle class life. As the quintessential antihero, Mitchum does spark at least some of our sympathies. However, Bowden, the lawyer, uses the law for the wrong reasons. He overreacts and violates an individual's personal space to fulfill baseless suspicions without evidence. He also uses his wealth, earned in the legal profession, to bribe Cady, who mocks Bowden's money with arrogance. However, in the end, the law is absolutely pointless. As a staunch representative of the law, even Bowden realizes the law does not always serve justice. Simple stated, the law doesn't always work for the people. Friedrich Nietzsche once wrote, "Beware that when fighting monsters you yourself do not become a monster." Cape Fear is a visual testament to that powerful statement. In the early 60s, a decade after McCarthyism and in the midst of the Cold War's hottest years, that notion was on the tongue of many Americans. While they knew a powerful enemy had to be confronted and defeated, many Americans were becoming increasingly more aware of how that enemy was to be defeated. Cape Fear was also instrumental in burying the remaining vestiges of the Production Code. In fact, the film mocked some of that code's most cherished principles. Many suggestions were offered to remove a number of the sexual innuendos that infiltrate the film, including footage of Mitchum's naked chest; his comment that "Nancy (Bowden's daughter) is getting to be almost as juicy as your wife"; Cady's line "I kept her busy for three days"; and a scene where Cady deliberately knees a man in his genitalia. For a 1962 audience, and emerging in the shadows of such code-breakers as Psycho and Some Like it Hot, Cape Fear still shocked many. Martin Scorcese's faithful 1991 remake does a great service to the original. It faithfully captures all of its resonant themes while still offering a unique interpretation of the original story. Fortunately, Mitchum and Peck both make cameos in the remake, and both earned plenty of money from its popularity. They deserve such rewards. As two of America's greatest actors, they offer horror fans a unique, unpredictable thriller that is sure to engage many. Submitted by afraid flying (not verified) on Tue, 2010-06-15 11:24. 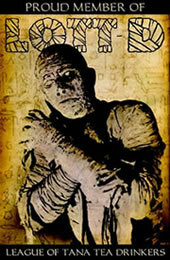 Martin Scorsese takes his first whack at the horror/thriller genre with a remake of the 1962 classic of the same title. While I can not truthfully say the original was better due to the fact that I never saw the original, I have a feeling that Scorsese has brought his maestro touch to the film that changes it slightly from the original to make it better, because this is quite the suspenser. The original is way better. Submitted by Anonymous (not verified) on Wed, 2011-04-20 03:33.